It is an exciting time right now in the Village of Dexter, Michigan. This quaint, relatively new community in Washtenaw County, about 10 miles northwest of downtown Ann Arbor, is growing faster than Jack's fabled beanstalk, with its population more than doubling since 1990, according to its official website (http://www.dextermi.gov/). And that's not even the really exciting part! The village is in the beginning stages of petitioning for cityhood. A group of local residents submitted petitions to the Boundary Commission in August 2012 and approximately two months later, that commission deemed their petitions legally sufficient, so the matter now resides in the Washtenaw County Clerk's Office awaiting the May 7 referendum election. For more information on this fascinating political drama, check out this Village of Dexter Cityhood Fact Sheet. Located on the lovely banks of Mill Creek and the Huron River, the village had a total population of 4,067 people in 2012, which is an increase of about 27.6 percent since 2000. The homes for sale in Dexter during that same time period had a median price of $199,700, with a 2.13 percent home appreciation. Dexter is an outdoor lover's paradise in many ways. 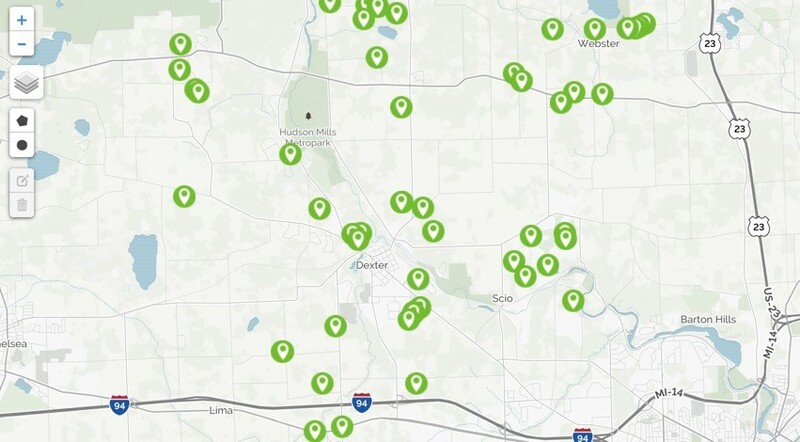 Take an afternoon hike or stroll along the sun-dappled sidewalks; hop on your bike and pedal along the border-to-border trail from Dexter-Huron Metropark to the Hudson Mills Metropark; stop and stay awhile at one of these places and try some disc golf, tennis, cross-country skiing or fishing. Autumn decorates the yards of homes for sale in Dexter in brilliant hues of red, yellow, green and many, many other beautiful colors. It is also the time of year when the village welcomes folks from all over the region who make their way to Dexter to sample the magnificent cider produced at the Dexter Cider Mill, the oldest continuously running cider mill in the state. The village has a long and interesting history. The area in which it resides today was initially settled in 1824, more than 10 years prior to Michigan becoming a state. Samuel W. Dexter, a land speculator at the time, is credited with originating the village. It carried the moniker, "Mill Creek Settlement" until 1830, when it officially became Dexter.